Posted on 17, May 2016 by EuropaWire PR Editors | This entry was posted in Art & Culture, Energy, Gas & Oil, Russia and tagged LED modules, LIGHT CUBE art object, PJSC LUKOIL. Bookmark the permalink. MOSCOW, 17-May-2016 — /EuropaWire/ — The LIGHT CUBE art object has been installed on top of PJSC LUKOIL head office, at 11 Sretensky boulevard in Moscow. It is in pilot operation now. This innovative project is a unique installation consisting of a three-dimensional block of individually controlled LED modules, which can reproduce various dynamic and static 3D images. 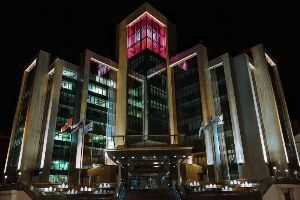 The LIGHT CUBE is the project, which won the 2014 All-Russian Open Contest, initiated to select an art and architectural decorative fixture on the facade of the Company’s head office. The contest was held as part of the Design Territory special project on the request of LUKOIL with support of the Moscow’s Committee for Architecture and Urban Development.